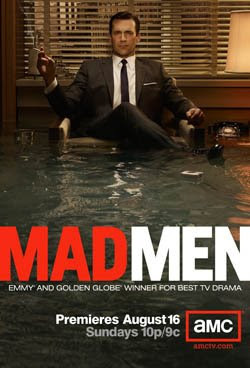 The award winning drama from AMC, Mad Men, is back on August 16th. This stunning series, set in the world of the New York 1960s advertising industry, boasts superlative writing and exceptional acting. This moody, introspective drama, beautifully designed and shot, is highly recommended to those of you who enjoy character driven, ensemble work. The promotional frenzy has started, with gorgeous spreads in Vanity Fair, and a number of New York based events, as well as the marketing push from AMC. 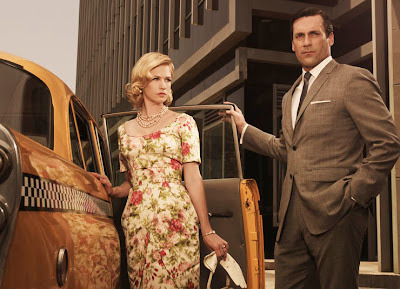 Here's the Annie Leibowitz shot of Jon Hamm and January Jones (Don and Betty Draper to you and me) from Vanity Fair. 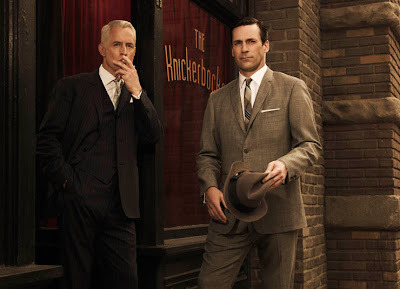 Beautiful images from the Mad Men gallery by Frank Ockenfels 3 on the AMC website. Pop over and have a look at the full gallery of 15 images. Here's a video covering the shoot for the key ad art, showing Don underwater in his office! Join me every week from August 17th for episodic reviews! Thanks to Vanity Fair, AMC and Frank Ockenfels for the images and promos.